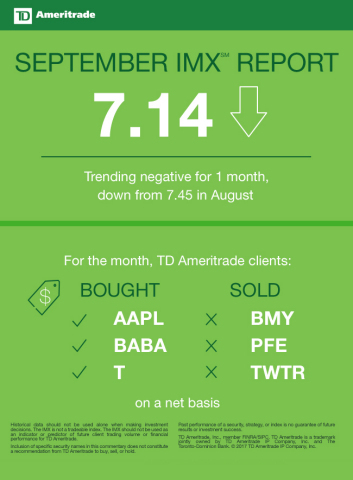 The September 2017 Investor Movement Index® marked a decline for the first time in five months, dropping to 7.14, as TD Ameritrade clients drew down exposure to equity markets, TD Ameritrade, Inc. (“TD Ameritrade”), a broker-dealer subsidiary of TD Ameritrade Holding Corporation (Nasdaq: AMTD), announced today. The Investor Movement Index, or the IMXSM, is a proprietary, behavior-based index created by TD Ameritrade that aggregates Main Street investor positions and activity to measure what investors are actually doing and how they are positioned in the markets. The IMX reading for September indicates a slight decline following an all-time high reached in August. TD Ameritrade clients maintained an overall bullish trend for the eighth month, despite reducing equity exposure. The IMX was impacted by decreased relative volatility in widely held positions, including Apple Inc. (AAPL) and Facebook Inc. (FB), and lower exposure within client accounts. Positive market moves potentially motivated investors to stay engaged, amidst multiple natural disasters impacting the U.S. and rising geopolitical concerns. Market indices ended September at all-time highs– S&P 500 and Nasdaq Composite posted gains in excess of 3 percent- with an average intraday move of 40 basis points on the S&P 500. “Despite being net buyers of stocks in the month of September, our clients slightly reduced their overall exposure to the market heading into the last quarter of the year,” said JJ Kinahan, chief market strategist at TD Ameritrade. TD Ameritrade clients seemed to recognize a buying opportunity within the technology sector following the launch of three new iPhone models by Apple Inc. (AAPL) during the September period. Clients were also buyers of Chinese stocks including Alibaba Group Holding Ltd. (BABA), Tencent Holdings Ltd. (TCEHY) and JD.com Inc. (JD), following an announcement that each company would further invest in the international, digital payment space. AT&T Inc. (T), which saw a large pullback early in the month, then subsequent recovery, was also net bought. Home Depot Inc. (HD) was a net buy following a third-party analyst upgrade, projecting an increase in revenue as rebuilding efforts begin after Hurricanes Harvey and Irma hit part of the U.S. Additional popular names bought include Amazon Inc.(AMZN) and Advanced Micro Devices Inc. (AMD). TD Ameritrade clients seemingly used price increases among certain names as a selling opportunity during the September period. Drug manufacturers Bristol-Myers Squibb (BMY) and Pfizer Inc. (PFE) were net sold in September. Both reached a 52-week high, with analysts upgrading Pfizer and Bristol-Myers Squibb receiving approval from the FDA for Opdivo, a liver cancer drug. Gilead Sciences Inc. (GILD), which also reached a 52-week high, was net sold following its buyout of Kite Pharma. Citigroup Inc. (C) reached yearly highs after the Federal Reserve announced it would begin normalizing its balance sheet, and was a net sell. Following the Organization of the Petroleum Exporting Countries (OPEC) announcing firmer compliance to its production cuts, ConocoPhillips Corp. (COP) and Chevron Corp. (CVX) traded higher and were net sold. Additional names sold include Twitter Inc. (TWTR) and Ford Motor Co. (F).